Although most sources say that the Russians were supplied with great amounts of equipment and food as part of Lend-Lease program, I have not in all my years living in Russia seen US labeled machinery. I understand that it has been many years since WWII, but I would expect such technology to survive in some way, like in museums, memorials, etc. I have not found any documentation on this online. Knowing that Russians were reluctant to admit receiving aid, esp. US aid, could it be that they rebranded the machinery with soviet labels? Or did they just decommission them ASAP? P.S. I lived near Vladivostok, where allegedly 49% of the aid came through. To give an idea of the scope of Lend-Lease, I found this contemporary account of the complete British Lend-Lease supply to the Soviet Union during WWII by the British Prime Minster. It is truly breathtaking in scope. Tanks, guns, trucks, weapons, ships, ammo, radar, radios, telephones, cables, tires, camouflage, mines, aircraft, oil, copper, iron, aluminum, diamonds, rubber, wool, food, machine parts, power plants, medicine. That's just from Britain. The US sent even more. An exhaustive list from From Major Jordan's Diaries puts the value at over $9 billion in the 1940s. (That source is not official, it's from an Army officer's notes and published in the hey-day of anti-Soviet hysteria, but it's the best I've seen). That said, walking around casually in the US I don't see any WWII equipment either. Lend-Lease equipment would be 70 years old and no longer in use. The majority would have either been destroyed on the battlefield (for example, the Soviets lost 77% of their tanks), or scrapped. Survivors will be in museums, old factories, rusting in a field somewhere, or sunk under water. If you want to see WWII military equipment, do what I do and go to a military museum. 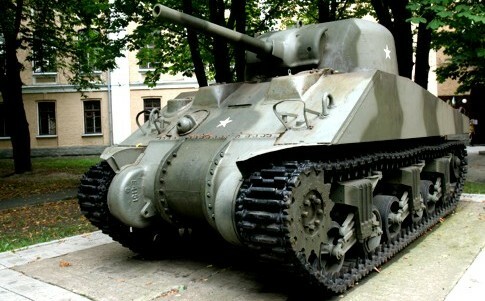 This M4 Sherman is on display at the Central Museum of Armed Forces of Ukraine in Kiev. It was knocked out by the Germans during the Great Patriotic War and recovered from a bog in 2004. 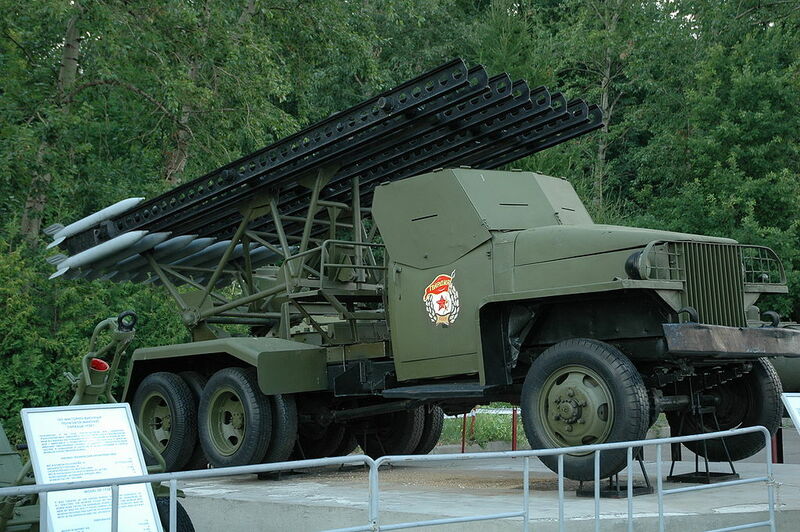 Here is a BM-13N Katyusha on display at the Museum of the Great Patriotic War. It uses a Lend-Lease US-built Studebaker US6 truck as its base. 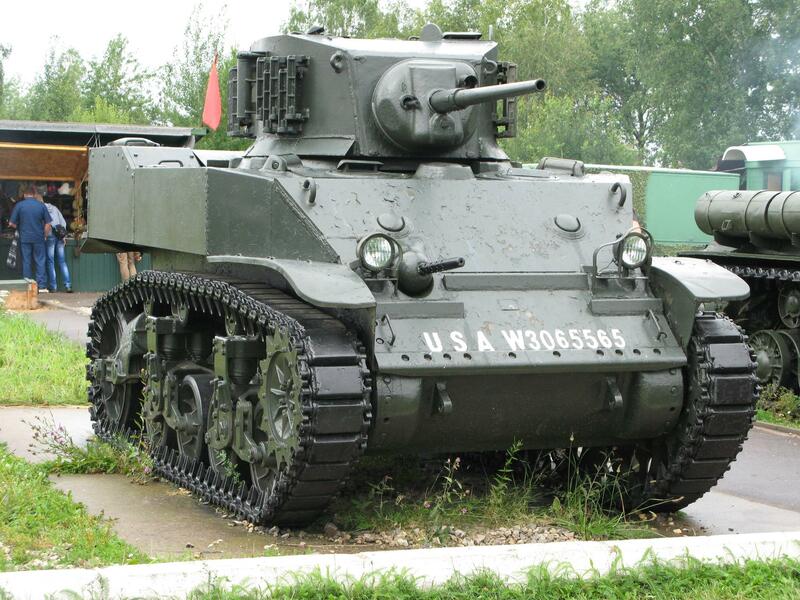 The Kubinka Tank Museum has examples of M3 Lee, M4 Sherman and M5 Honey American tanks. Whether they are Lend-Lease or battlefield salvage I do not know (I'm doubtful about the M5 as the US only sent 5 of them). They're painted rather generically. 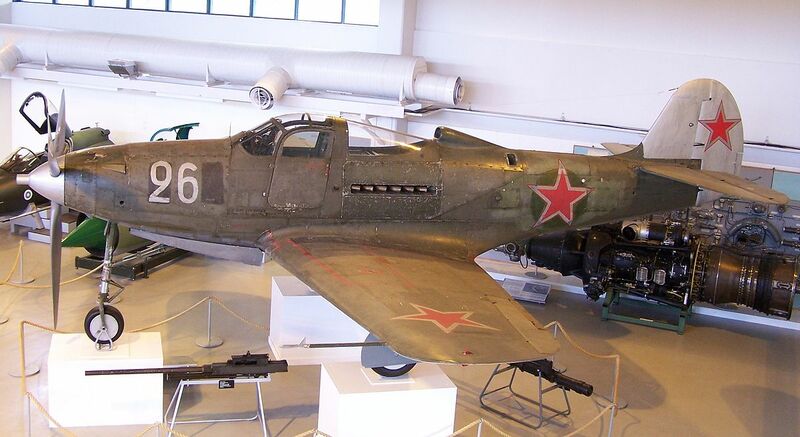 Here is a Lend-Lease P-39Q Aircobra at the Aviation Museum of Central Finland, shot down and captured by the Finns during WWII. Large lend-lease naval ships are a bit easier to track down. Here's some examples. HMS Royal Sovereign, a WWI British battleship on loan to the USSR, was returned to Britain in 1949 and scrapped. The cruiser USS Milwaukee was sent to the USSR, returned in 1949, and scrapped. The icebreaker USCGC Southwind was loaned to the Soviets as the Admiral Makarov, returned to the US Navy in 1950, and served as the USS Atka and later USCGC Southwind until 1974 and scrapped. There is a 1-room American Lend-Lease Museum located in school #1262 6 Zhitnaya Street in Moscow which hardly anyone ever visits. The exhibits include all manner of Lend-Lease items--a jeep, several motorcycles, a pack of Lucky Strike cigarettes (green); canteens, compasses, uniform clothing, canned food, etc. and a wall display of photos depicting Lend-Lease events during the war. A proper museum would include samples of the Sherman tanks, locomotives, artillery, trucks and combat aircraft that were delivered to the USSR in the tens of thousands. The museum is difficult to visit since school is in session.The museum is said to be established by lend-lease enthusiasts in Russia. The Russian government has made a concerted effort to downplay America's role in the Russian victory over fascism. During the war, whenever a Russian Sherman tank battalion liberated a city, Stalin forbade victory parades which would reveal the massive Allied contribution to Russian victories. Most of the military hardware was shipped via The Persian Corridor (see Wikipedia for details).Combat aircraft were flown from Alaska to Siberian airfields by Russian air and ground crews who received training in Alaska. Some of the land-lease things were of course consumed. Some things were returned. The following is based on an eyewitness account that I've heard in my youth. The person who told me this was a truck driver in 1945, driving a Studebaker truck. Few months after the war ended, he was told that the truck is to be returned to the US, and it must be in an ideal condition. They spent weeks on repair, and in the end the truck was like new. Then they drove it to Vladivostok, where they were supposed to be loaded to the US ships. He described an enormous line of many thousand trucks (all looked like new). Then he described their surprise: all these wonderful trucks went under press. The press made a little compact piece of metal of each truck, and these pieces were loaded to the ship! Considering smaller items, I remember I possessed two: a military flask made of aluminium, and stamped "US Army" and a wool sweater, of exceptional quality which I inherited from my mother. According to my mother, this sweater came in a parcel with American help, probably not a part of land-lease, just a private help. On machine tools. Probably they constituted a very small portion of the US help. When visiting factories in 1960s I've seen a lot of German machinery, and nobody cared to remove labels. But no US machinery.Most of land-lease help consisted of ready, final products. There's a book named Eastern Approaches by a British commando called Fitzroy Maclean, who was attached to the Yugoslav partisans. My American comrade and I accompanied the column of Soviet troops. One Soviet soldier showed off his truck to us. The Soviet boasted 'you can't find engineering like this iN Capitalist countries. Only the socialist system could be capable of creating it'. The American said to me 'It makes me sick to see a great American car in the hands of these Commies'. In the interests of inter-allied harmony, I decided to leave both remarks untranslated. MacLean mentioned that the truck was covered with Soviet emblems, no corporate logos. So your intuition is right, the Soviets rebranded US aid, to the extent that many Soviets apparently didn't know they were receiving it.
. -I was assigned to the USCGC SOUTHWIND in the early 1970's. It was a polar class icebreaker that was part of the U. S. Navy (then known as the USS ATKA) during part of World War II. It was turned over from the U. S. Navy to Russia during the second world war under the Lend-Lease Program. I am sure it was because we had occasion to remove labeling from electrical devices that identified the electrical service the device (switches for example) was connected to. The labels were engraved in English on the front but were engraved in Cyrillic on the back. I don't know if ATKA saw a Russian port while in service to Russia. My understanding is that when the war ended Russia abandoned the ship in the ice off Greenland and notified the U. S. government of the ship's location. Not the answer you're looking for? Browse other questions tagged world-war-two military soviet-union or ask your own question. What role (if any) did lend-lease equipment play in the Second Battle of El-Alamein? When were 1942 lend-lease trucks sold to the public?